Do rent yields follow other returns? A few weeks ago I put together a graph on 10-year treasury yields vs. S&P earnings yield. For those of you tired of hearing how stocks are overvalued, or in a “bubble”, you can take solace that there’s a reason stocks are valued as they are. P/E ratios are tightly, inversely correlated to 10-year treasury yields. But what about houses? More and more, houses are bought and sold for rent yield just like stocks and bonds. Therefore, the rent/price yield should move in tandem with earnings/price or 10-year treasury rates. Below is the same graphic as from the previous article, but including rent/price. At first glance, it looks like the relationship fails with houses. For one, house prices didn’t drop as much as they should have as interest rates spiked in the 1970’s. Secondly, rent yields tanked just as treasury yields and S&P earnings yield jumped in the mid 2000’s. 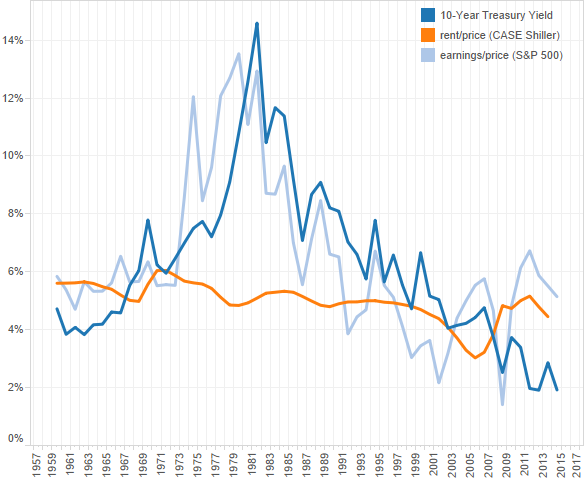 Thirdly, the secular trend downwards in both earnings/price and treasury yields held somewhat for rent/price until the end of the “bubble” years, when rent yields reverted back to historical norms rather than following interest rates. The question is, should yields should stay historically constant (and are unrealistically high or low when not), or was the bubble bursting an aberration caused by an overly aggressive Fed? The recovery of housing prices since the so-called bubble seems to suggest that house prices were trying to rise in conjunction with lower rates. But the Fed head-faked, tanking nominal GDP growth and house prices with it. Now rent yields are dropping again in (correct) anticipation of long-term low interest rates and low inflation. Bottom line, rent yields are too high at the moment compared to risk-free rates of return. Thus rents must either fall (and NGDP collapse), or house prices must continue to rise to bring the market back into balance. Despite high P/E ratios, the fact that interest rates are ultra low (and set to stay there) means stocks prices should also still rise to adjust to interest rate expectations. Conclusion, everything you’re hearing about a restart of the housing bubble and a new stock market bubble is bogus. All along prices were trying to adjust to the correct, higher level. It just remains to be seen whether monetary policy will let this adjustment happen, or clamp down at the worst moment.